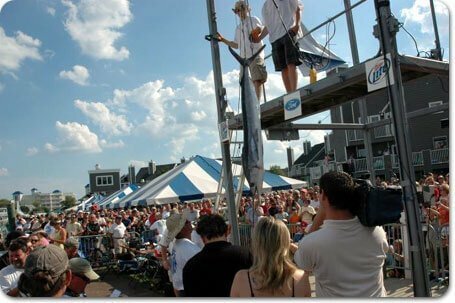 The White Marlin Open is an event that can be fun and exciting for the spectators as well as the anglers. All fish must be weighed on the official scale at Harbour Island, (14th Street and the Bay), and the weigh-ins are held there each day of the tournament from 4:00 to 9:15 PM and are open to the public free of charge. As the week goes on, the suspense builds, as potential lottery sized fortunes change hands with a tip of the scale. It’s a terrific way to spend a few exciting hours during your Ocean City vacation. Boats can leave the inlet of their choice no earlier than 4:00am. Each boat must stop fishing by 3:30pm. If an angler still has a fish on the line at 3:30, the fish may be played until it is lost, boated, or released. Boats usually will be fishing from 2 to 4 hours off-shore, so generally the activity is heaviest from 5:30pm to 7:30pm. The seas can sometime kick up and cause a slower trip back. Often an angler fighting a big tuna, or blue marlin, may be delayed. An angler fighting a blue marlin at 3:30 pm, is given an extension. Regardless of the day hooked-up, the angler has until Saturday, Aug. 11, at 12:15 AM to bring the fish to the scale. There is no parking available at Harbour Island, but there is ample parking within a few block walk. The Presbyterian Church on 14th Street, just a block away offers parking for a small donation. Parking is also available at Holy Savior Church on 17th Street. There will also be a “Park and Ride Shuttle Service” offered from the Convention Center parking lot.